I received an email the other day from a Kiara Wilson of Motorcycle House (www.motorcyclehouse.com) a few days back. She had seen our site and asked if we were interested in doing a review of some of their riding gear. They would make the gear available for free if we would agree to review it on our site giving our honest opinion. I did a precursory check of their website and found that much of Motorcycle House’s gear is cruiser oriented, so I initially declined adding that we don’t really use cruiser gear and therefore couldn’t give an honest opinion. Kiara suggested that I spend some more time on their site and browse through all their items and let her know if there was anything we would be interested in reviewing. 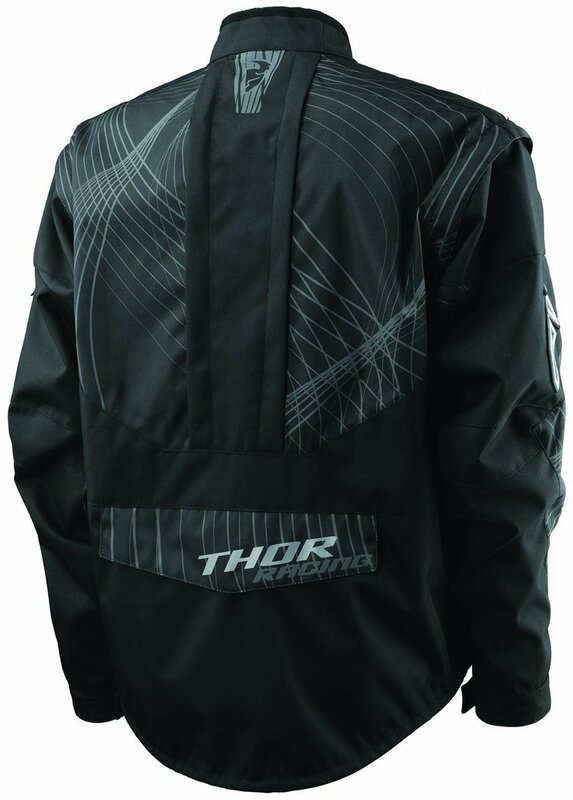 While I was browsing, Kiara suggested that I might be interested in the Thor Phase Jacket. So I checked it out and it seemed to be a nice piece of enduro gear. I reinforced the fact that I would give an honest review and that there were no promises that the review would be positive. But I did promise that the review would be honest. I also let her know that it was the middle of winter in New Hampshire, so I likely would not be able to give a full riding impression until things warmed up. Kiara agreed to all of this and as such I agreed to do a review of the jacket. Before I knew it, a Thor Phase Jacket arrived at my home. I opened the box and was surprised at the contents. My first impression was positive. The quality seemed good, but the engineering of the jacket was what impressed me. The front of the jacket had two 12 inch long air vents complete with waterproof zippers. These types of zippers are more expensive compared to the normal zippers. The pulls are good sized and you can open and close them with a gloved hand. There was none of the “stickiness” that waterproof zippers sometimes have. The main zipper of the jacket is not waterproof but it does have an inch wide flap covering it with Velcro to hold the flap over the zipper. For normal riding it should do a good job of keeping the wet outside where it belongs. The back of the jacket has a similar 15 inch air vent zipper. Inside the jacket is a mesh inner liner to help move the air around your body and keep the outer shell of the jacket off your body. There is also a an inner pocket lined with fleece big enough for your smart phone/music player. It even has a flap with Velcro to hold your ear bud cord in place. Nice. An interesting feature are the zip off sleeves. So if it’s really hot out there and you are comfortable riding without the additional protection sleeves provide, they can be quickly removed and replaced when things cool off a bit. Near the cuff of the left sleeve is a small 6 x 4 inch zippered compartment with a clear cover. It seems to me that this would be a good place to store your license or other motorcycle documents. This is perfect if you find yourself in one of those aww, sh!# situations where you have to produce documents. The cuffs are also adjustable with a zipper and Velcro tabs to set the adjustments. So on those hot days with the sleeves on, you can also open the cuffs and leave them wide open for some cooling airflow. In the back of the jacket is a built in ditty bag that could hold perhaps some light tools, a tire tube and similar gear. It could even hold those zip off sleeves. The compartment also contains a belt so that you can fold up the jacket into the compartment and wear it like a bum bag. This is a great idea for those “off the bike” times. So all in all, not yet having ridden with the jacket I am pretty impressed. It seems like a good piece of kit and I am anxious to try it out. Does the above mean that there isn’t anything I don’t like about the jacket? No, but my concerns are quite minor. 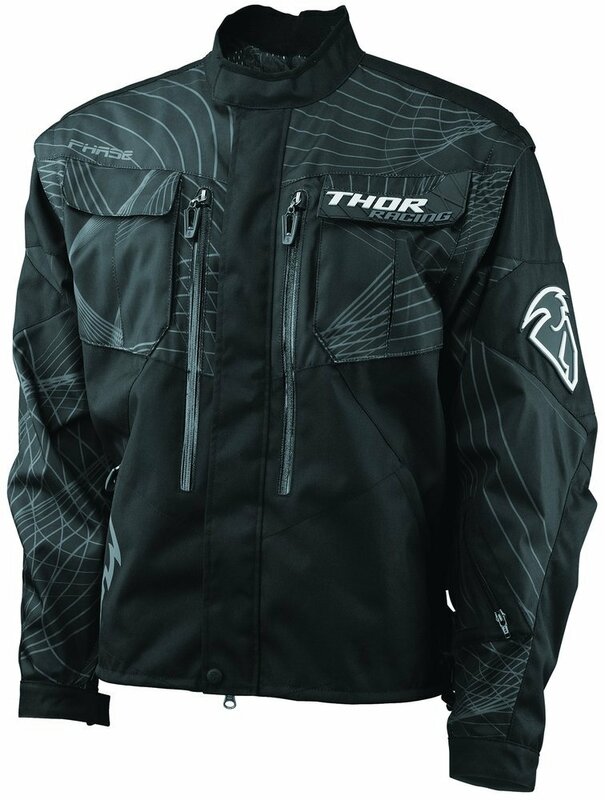 This is a Thor piece of gear and has roots in the Motocross world. As such, the graphics are a bit much for me. The jacket itself is black, but there are some graphics applied that I could do without. It also has some sewn on rubber bits with the Thor logo on it that I don’t care for. But other than those niggles, I’m a pretty happy camper with the jacket and the fact that Motorcycle House made the gear available to us for free. If you would like to view the jacket at Motorcycle House’s page click here. If you’d like to see their entire jacket selection, click here. Stay tuned for a riding impression and video when things warm up. This entry was posted on January 10, 2015 by Ride2Adventure. It was filed under Adventure, adventure motorcycle, Adventure Motorcycling, adventure ride, adventure riders, Adventure Rides, adventure riding, enduro, gear, off road, Uncategorized and was tagged with adventure bike, adventure ride, dual sport, enduro, jacket, motorcycle gear, motorcycle house, off road, ride2adv, ride2adventure, thor, Thor Phase Jacket.